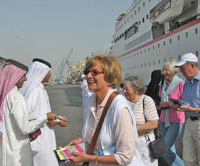 PASSENGERS from the Deutschland, a tourist ship cruising in the Gulf, were the first to take advantage of the easing of entry procedures for arrival in Qatar. The 400 passengers and 260 crew members were greeted on their arrival in Doha by true Qatari hospitality as members of the Qatar Tourism and Exhibitions Authority (QTEA) welcomed them at a small ceremony. A traditional Qatari band and a falcon were in action, while the tourists sampled Arabic coffee and dates. This will enable the authority to attract new travellers to Qatar. “We have been discussing with major tour operators and cruising companies the possibility to add Qatar on the cruising map during their trips in the Middle East” he said. QTEA staff offered brochures and maps to the visitors, who were briefed on Qatar and its attributes as a tourist destination. Gulf Adventures, the cruise tour agents, organised a desert safari to Khor Al Odeid, the unique inland sea surrounded by sand dunes, a trip to the fine artworks of the Museum of Islamic Art, an extended tour of the capital, taking in the Corniche and Souq Waqif.